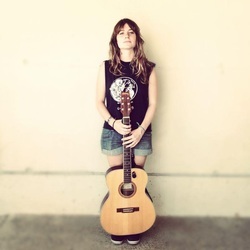 Melissa Lara Clissold is a 30 year old singer, song-writer and guitarist based in Istanbul, Turkey. 'The Duke of Edinburgh's International Award' and later as consultant for the same Award. She currently works as an editor for independent news platform Medyascope whilst also singing in a Reggae-Rock band 'Zeytin' and an all female MC-DJ collective 'Sista Soundsystem'. She is also the co-founder of 'Jam Sessions Turkey', an initiative that aims for positive social change through music. Her latest personal project is 'Sista Theta'; explorer of sound, consciousness and movement. Finally she is also part of electronic music project 'Valley's Echo'. ​She currently does a lot of freelance work such as voiceover work, jingle music, English-Turkish translation. Passionate about promoting local sounds, she supports 'Beton Orman' (Concrete Jungle) a local initiative promoting the underground music scene in Turkey, as well as carrying out the booking for some DJs & artists especially from Istanbul. Moreover she volunteers for Psybient.Org; a website dedicating to spreading information about electronic-ambient-psychedelic music worldwide. A lover of music festivals, she embraces sustainable & conscious ways of living, vegetarian & vegan food, good books, and the positive power of the internet! Melissa was born in Ankara, Turkey to an English/Irish father and a Turkish mother she has travelled and lived in various countries such as Nigeria, UK, Poland and Turkey due to the nature of her parents work. After studying English Literature and Philosophy at The University of York, she carried on to finish her MA in Social Anthropology of Development at the School of Oriental and African Studies. Her experience at The British Red Cross working with refugees and international volunteers at Inter-Cultural Youth Exchange-UK sparked her passion for humanitarian activism. She has been working in the social sector ever since. After the UK, Melissa moved to Spain to work as an English Teaching Assistant for The British Council in a small Catalan sea-side town for 2 years where she also started singing in her first reggae band 'Soul Dimension'. Melissa started playing piano at 9 years old, electric guitar at 16 and acoustic at 17 and played clarinet for two years from 14-16 at school. Influenced by her parents & friends music taste, music has always been her true passion.